The Audi A3 is an entry-level luxury car/small family car Manufactured by the German automaker Audi since 1996. There are two generations of A3 that exist, both based on the Volkswagen Group A platform, which they share with a number of other models such as Audi TT, Volkswagen Golf, Caddy and Touran in addition to Škoda Octavia as well SEAT León. 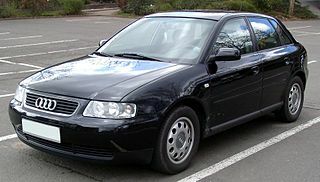 The first A3 (or Typ 8L) was introduced in the European markets in 1996, Audi's return to the lower market segments since the dropping of the Audi 50. This was the initial Volkswagen Group model to use the "PQ34" or "A4" platform, bearing a close resemblance to its contemporary, the Volkswagen Golf Mk4. The vehicle was at first offered only with a three-door hatchback body, in an effort to represent a far sportier image in comparison to the Golf, in both front- as well as four-wheel drive. All engines had a four-cylinder configuration and were transversely positioned. Following the A4, the Audi A3 was the 2nd model within the Audi line to utilise five valves per cylinder. In 1999, Audi extended the variety with the introduction of much more powerful variations: a 1.8 Turbo with 180 PS (132 kW)) and a 1.9 I4 TDI Diesel with pumpe-düse technology and variable geometry turbocharger. The four-wheel-drive A3 1.8T quattro used either the 150 hp (110 kW) or 180 PS (132 kW) motor and the identical Haldex Traction-based all-wheel drive system just like the Audi S3 and the Audi TT. 1999 was also the year Audi was forced to bow to market demands and introduced a hastily-conceived 5 door body which the company had not previously intended to produce. In late 2000, the A3 series was modified with the use of new headlights and rear light clusters, other small cosmetic alterations, an improved interior, and the introduction of a six-speed manual gearbox, for a 180 PS (178 hp/132 kW) 1.8 Turbo and the brand new 130 PS (96 kW) 1.9 TDI. Audi's ESP (Electronic Stability Program) traction-control and brake force distribution computer ended up being standard equipment. Sadly the A3 was never supplied with more powerful 1.9TDI motor, the 150bhp unit available in the VW Golf GTI and SEAT Leon FR. Despite the fact that the Audi A3 was replaced in Europe during 2003, the first generation model continues to be sold in developing countries. Right after production of the 1st generation model ceased in Brazil, the retail value increased from R$60,000(US$30,000) to R$100,000 (US$50,000). The motors used are the identical to many other cars in the Volkswagen Group. IIn the 2003 Geneva Motor Show, Audi unveiled the second-generation of the A3, the Typ 8P, designed by Walter de'Silva. Initially launched only as a three-door hatchback with four cylinder engines, it featured a new vehicle platform (the PQ35 platform), a revamped and a lot more spacious interior, new gas engines with Fuel Stratified Injection (FSI), and standard six-speed manual gearboxes (excluding on the base 1.6). In mid 2003, the line was refreshed with two sports-orientated models, a 2.0 Turbo-FSI version with 200 PS (197 hp/147 kW), as well as a 3.2 VR6 engine (for the very first time) with 250 PS (247 hp/184 kW). Haldex Traction-based quattro four wheel drive, and the S-Tronic semi-auto gearbox have been introduced as optionals (quattro is standard on the VR6) on every model 140 PS (138 hp/103 kW) and over. A brand new 5 door body, referred to as "Sportback", was introduced in June 2004. In contrast to the previous generation, the brand new A3 Sportback is 80 mm (3.15 in) longer than the base three-door body, and includes enhanced rear cabin space and a bigger luggage compartment (370 litres). It also obtained the new "single frame" front grille initially unveiled in the A8 W12. In 2005, the "S-line" trim level, with unique stylish great looking elements, became featured in certain models, and the 3-door obtained the same front as the Sportback. For the very first time, the A3 became available in the North American market, only with the Sportback body, with the base 2.0 straight-4 TFSI unveiled in 2005 as a 2006 model and the 3.2 V6 quattro following in 2006. 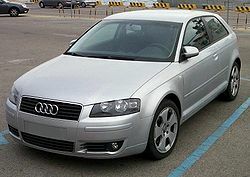 In the Spring of 2005, Audi began a large alternate reality game to advertise for the A3, known as The Art of the Heist. In April 2006, the lineup was extended with the introduction of a much more powerful 2.0 TDI with 170 PS (168 hp/125 kW). In August 2006, Audi announced the arrival of the S3 version, which became the new range topper. The 2.0 TFSI motor was re-engineered and uprated to 265 PS (261 hp/195 kW), and is available with standard quattro and a 6-speed manual gearbox. The second generation S3 can manage accelerating to 100 km/h (62.1 mph) in 5.7 seconds. The springs and dampers were tuned for a harder setting, and ride height lowered by 25 mm (0.98 in). 225/40 ZR18 tyres are standard. In January 2007, the normally aspirated (non-turbo) 2.0 FSI was substituted with a new turbocharged 1.8 TFSI engine, with 160 PS (158 hp/118 kW). It is available in front-wheel drive only. In late 2007, Audi unveiled a brand new 125 PS (123 hp/92 kW) 1.4L TFSI engine to use on the A3, replacing the 1.6 FSI engine, and a new diesel "e"-model. The "e"-model, Audi's equivalent of Volkswagen's BlueMotion, is available with the 1.9L TDI engine, and offers a much more ecological car, with a CO2 emission below 120 g/km. In 2008, Audi launched more than a few alterations to the A3 and S3. These include revised nose and tail styles, by using a modified grille and the new "trademark" daytime running lights, common rail 2.0 TDI engines, 7-speed S-tronic twin clutch transmission availability for the smaller non-U.S. engines, and optional "magnetic ride" adaptive shock absorbers. Additionally, the variety now is comprised of an S3 Sportback model. The engines used are the same as for many other cars in the Volkswagen Group.